The journey back has been a long, tiring one. We thought we hit rock bottom after the financial collapse in 2008, but the solutions to that problem only prolonged our descent. The kicking of the can down the road has led us to today where our debt is unsustainable and our political deals are unacceptable. Are we at rock bottom now? The Dow drops as does our nation's financial rating from Standard & Poor's. Unemployment is high. Gas prices are high. Consumer confidence and the housing market are at all time lows. Normally, it is at this point in the journey that the desert wanderers forge Aaron's calf out of gold and start worshipping it. Unrest begins to grow. But, conservatives know that despite how low we are as a nation right now, there is a light that has burning in the distance since we started this journey back in 2008. There is a sense that the light is growing closer. Clarice Feldman at American Thinker describes the latest rage coming from the left as a sign that the liberal flame is dimming. As time has passed, I have come to believe that the reactions I received represented a rage at the dying of all that which these men had embraced in the absolute certainty of the righteousness and soundness of their views, and their right to have them automatically accepted as the approved model for all right thinking people. In fact, the tea party, Sarah Palin, and all of us who eschew bigger government and demand accountability and self-determination are beginning to expand our reach. We are, as reporters in England and Australia note with regard to the debt limit negotiations, showing up worldwide socialism as a foolish and bankrupt notion. I suppose if I had coasted through my adult life secure in the belief that I was destined to rule others, that my thinking was the height of sophisticated reason and scientific logic, and I began to notice that that game was up, I'd be rude at dinner parties, too. I mean they are just raging at the dying of their light, aren't they? As the liberal light dims, the conservative light grows brighter. More and more Americans are becoming disillusioned with the empty promise of hope and change. President Obama's approval ratings are on the verge of plunging under 40%. Americans are sick of high gas prices. They're sick of being unemployed. They're sick of seeing their childrens' futures being mortgaged away with back breaking debt. They're sick of out of control spending and regulations. When this happens, it is always a sign that the party in power is just one election away from being booted out on their behinds with their stuff thrown in the street beside them. We can no longer accept it. We no longer can just hope for the best. No matter our differences, the one thing that unites Americans is a common belief in wanting to be let alone, in wanting to make better lives for ourselves and our children, in wanting to have as little intrusion in our lives by others and by government, in wanting the rules to apply fairly and equally to all, in wanting a chance to pursue our American dreams, and in wanting our government, to the degree that it does affect our lives, to act constructively and in service of our constitutive principles. So, this is my time for choosing, and I will choose Sarah Palin. Knowing what we know about her governorship, if we can get people to put aside the media myths and leftist lies about her, we could have great confidence in her ability to turn this sinking ship around and bring it back to life. Ronald Reagan said it best. My dream is that you will travel the road ahead with liberty's lamp guiding your steps and opportunity's arm steadying your way. 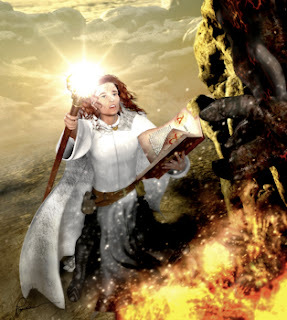 Governor Palin holds the lamp. While Standard & Poor's was lowering our nation's financial rating, Moody's increased Alaska's to AAA. That says a lot about the potential of Sarah Palin as president. At the same time, we see the failure of liberalism repeated again. In 1976, Jimmy Carter was elected president. We tried the big government approach then. It failed. The communist countries of eastern Europe tried socialism. It failed. This was the heaven on earth for which liberal democracy had been striving: a system of wealth redistribution that was merciful but not Marxist, and a guarantee of lifelong economic and social security for everyone that did not involve totalitarian government. This was the ideal the European Union was designed to entrench. It was the dream of Blairism, which adopted it as a replacement for the state socialism of Old Labour. And it is the aspiration of President Obama and his liberal Democrats, who want the United States to become a European-style social democracy. Also collapsing before our eyes is the lodestone of the Christian Socialist doctrine that has underpinned the EU’s political philosophy: the idea that a capitalist economy can support an ever-expanding socialist welfare state. We have arrived at the endgame of what was an untenable doctrine: to pay for the kind of entitlements that populations have been led to expect by their politicians, the wealth-creating sector has to be taxed to a degree that makes it almost impossible for it to create the wealth that is needed to pay for the entitlements that populations have been led to expect, etc, etc. History repeatedly has shown us its glaring examples of liberal socialism's failures. American history has shown us glaring examples of how unbridled conservativism has always been the antidote for the statist sickness whenever it befalls our nation. Ronald Reagan gave us the blue print the last time this happened. Sarah Palin knows that blueprint. There is a sense of faith that our future is bright despite the current indicators. Sarah Palin's words continue to burn bright. With hope and dedication nothing is impossible, and the Almighty never abandons those who seek the light. It may seem the darkest its ever been. It may look to be the lowest we've ever fallen domestically. But if you look off into the distance, the light does look brighter. Sarah Palin can bring us to that light. 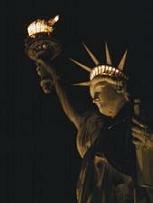 Her lamp of liberty guides our steps.